David Einhorn, the one-time hedge-fund wunderkind, likes to remind his headstrong young analysts that he has been around a lot longer than they have. During the dot-com craziness of the late 1990s, Einhorn tells them, newfangled measures like “eyeballs” and “stickiness” never did add up to profits. In 2008, when many hoped trouble would pass, he brazenly predicted Lehman Brothers would collapse. He was right, of course. But Einhorn, who achieved widespread fame at moments of maximum danger, is no longer the enfant terrible he once was. For starters, he’s turning 50 this year. And, in middle age, he has clung to his old ways even as many in his industry have moved on. Greenlight Capital has handed its investors a 15 percent loss, bringing the total decline since the end of 2014 to a staggering 25 percent — one of the worst showings among his peers. Investors have bolted, pulling almost $3 billion out of the firm in the last two years. Einhorn’s this-too-shall-pass attitude puts him in an interesting spot in a $3.2 trillion industry invented back in the day on strategies that don’t work so well now — after a decade of historically low interest rates and the rise of passive investing and quant trading. The Einhorn modus operandi of buying the beaten-down stocks of companies he expects to grow and selling those that are overvalued has fallen out of favor. Netflix Inc., even though in his early days as a value investor he would have never bought shares with such high prices relative to earnings. On the short side, some no longer bet against bubbles. They’re careful about identifying catalysts that might move a stock or have stopped shorting individual stocks all together, using options on indexes instead. And they’ve all performed better than Einhorn in the past few years. Einhorn, who declined to be interviewed for this article, started Greenlight in 1996 when he was 27, with $900,000 he assembled from family and friends. For much of his career he could do no wrong. 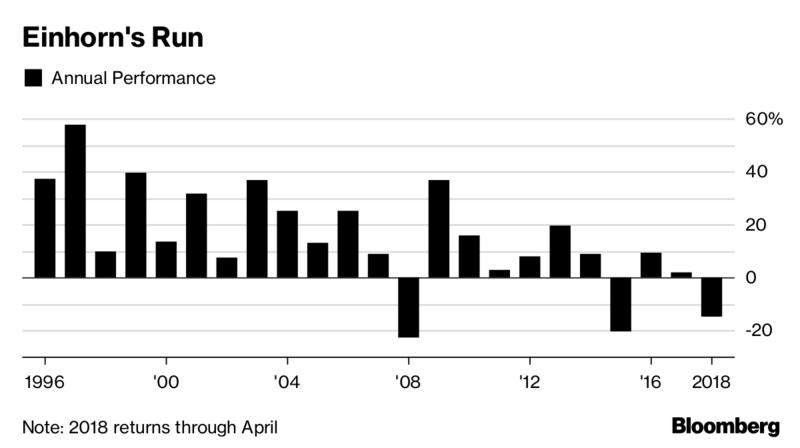 In 2002, he challenged the accounting practices of lender Allied Capital, a prophecy that eventually paid off, just as his Lehman prediction did. Every year, he was arguably the biggest draw at the Sohn Investment Conference. Value-investor groupies still consider his annual client dinner, held under the giant blue whale at the Museum of Natural History, as second only to Warren Buffett’s confab. Amazon.com Inc. While this sort of approach has worked well historically, there are market cycles that can mess things up. The last bull market was a value cycle; this one is a growth cycle. Bayer AG where it’s harder to have an edge. He has irked others by being dismissive of their questions in the same way that he pushes back when his young analysts suggest the boss’s metrics for choosing stocks are wrong or outmoded, according to people familiar with these discussions. Einhorn himself tells a story that captures what critics might call his hubris. He told colleagues about a recent dinner with other billionaire hedge-fund managers where they shared their stock ideas. While he didn’t go so far as to short their picks, he said their wagers made him like his own bets even more, according to people who heard him describe the evening. What he really meant, he later elaborated, was that time will show he’s right.